I am AJ from West Wales. I do not own a small holding, but love to dream that perhaps someday! Having said that, I do grow my own veg, ferret, longnet, shoot game, wildfowling and sometimes fish. I found the site by accident looking for a recipe and it came up in a google search. I love cooking and eating game, except Woodcock for some reason I just cannot get along with it. I have tried it in many many ways but none suit. I just cannot bring myself to cook it as it should be, with the intestines in. Seems like you are well on your way to old-style sufficiency of the hunting for the pot variety. I like that. Ireland and Wales? Been pot hunting for about 50 years now. But still looking for new ways to eat what I catch. Although I must say some meats taste the best to me just simply roasted or deep fried. Deep fried rabbit and a couple of slices of home made wholemeal bread a feast fit for a king. AJ, boyo, you are a mind reader! I've never had deep fried rabbit, I shall have to try that the next time my butcher has rabbits in stock. Toffeeapple said:I've never had deep fried rabbit, I shall have to try that the next time my butcher has rabbits in stock. To get the best fried rabbit use a rabbit that is half to three quarters grown. Thay will be moister and more tender at that age as they do not need a longer cooking time. 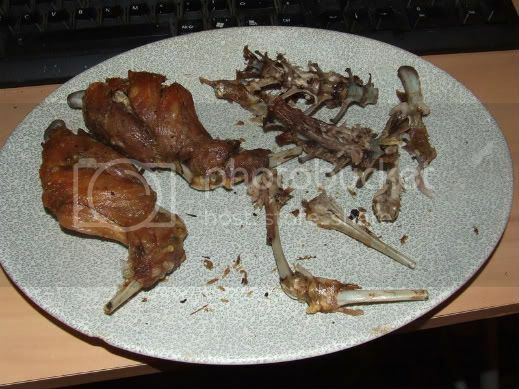 To make the fried rabbit joint the rabbit then place the rabbit in a casserole dish half full of lightly salted water and place in the center of a moderate oven (gas 5 170c ) for about half an hour. Take the rabbit out of the oven and allow to go cold and dry off. Heat your fat till it's almost smoking, ( we use best beef dripping but veg oil will do) Then add your rabbit to the fat covering straight away as it spits. Cook till the outside of the rabbit is browned take from the fat and allow to drain and cool a little on kitchen paper. Thank you, that sounds lovely. I like the idea of partly cooking it before frying. You'd get a better flavour by using dripping too. Welcome . i love a bit of fishing or shooting sill have not been out as i want to do a squrill & acorn sasage to see if it works will try anything lol. Hi AJ, I'm new as well. Hello Peasandpotatoes! Nice to have you join the forum, do tell us a little more about yourself?